Plasminogen Activator Inhibitor-1 (PAI-1) is a glycoprotein and member of the serine protease inhibitor (serpin) superfamily. PAI-1 is the primary inhibitor of tissue-type plasminogen activator (tPA) and urokinase-type plasminogen activator (uPA). This inhibition exhibits antiproteolytic properties that can lead to myocardial infarction, thromboembolic disease with elevated levels of PAI-1. Additionally, PAI-1 is thought to play a role in the function of tissue remodeling and tumor metastasis. This is an ELISA (Enzyme-Linked Immunosorbent Assay) for the quantitative analysis of PAI-1 levels in biological fluid. This PAI-1 test kit operates on the basis of sandwich ELISA where active PAI-1 complexes with uPA and is quantified with the use of an HRP labeled secondary antibody. 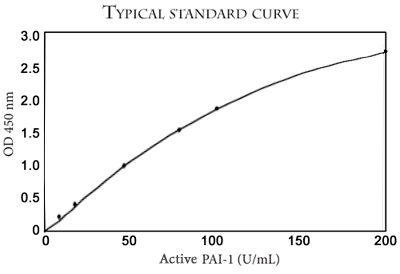 The functional or active PAI-1 will bind to the uPA coated on the well of the microtiter plate. The latent and complexed forms of PAI-1 will not bind and are discarded at a later washing step. Next, a PAI-1 primary antibody is added to the wells, binding to the captured PAI-1 on the microtiter plate. HRP conjugated secondary antibody is then added for detection of the active PAI-1. Quantitative test results are obtained by the measure and comparison of the sample and standard absorbance readings.